Oscoda's roots lie in the great lumbering boom of the 1800's. Nothing symbolizes that more than Oscoda's adoption of Paul Bunyan. The mythic lumberjack's stories were told by James MacGillivray, a local newspaperman and became the stuff of legends. By the early 20th century, the great forests of the area had been heavily looged out and what remained was destroyed in a huge forest fire in 1911. A major reforestation effort was made and today approximately a half million acres of forest stands in the Huron National Forest which extends inland from Oscoda. The approaches to the mouth of the Au Sable River and Oscoda Michigan are clear from all directions. Generally speaking, you want to stay offshore 2-3 nm to avoid any inshore shoaling. The entrance to the harbor is protected by two breakwalls. The northern breakwall is marked with a F RED light and horn, visible approximately 6 nm offshore. In fog, the horn can be activated by switching to VHF 79 and keying your microphone 5 times rapidly. The southern breakwall is marked with a Fl GREEN light, visible approximately 6 nm offshore. Once inside the river, there are several options for a transient sailor. NOTE: There is a fixed highway bridge at the end of the entrance channel with a charted vertical height of 23 feet/7 metres. When you come up the entrance channel, immediately before the highway bridge, there is a side channel on your port side. Enter this channel and follow it until you come to Bunyan Town Marina on your starboard side. There is transient docking for several boats. There is no fuel dock or pumpout station. There are restrooms and picnic areas. Main Pier Marina is located a little further along the side channel that opens to your port immediately before the fixed highway bridge. 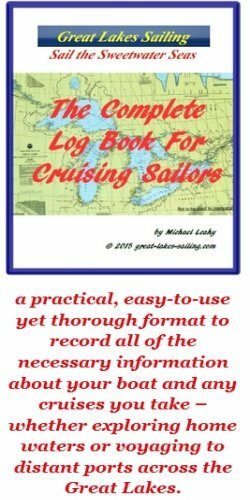 There are about 2 dozen slips available for visiting sailors. There is no fuel dock or pumpot station. There is water and power available at slips. There are restrooms, showers and laundry facilities. Amenities include picnic areas and BBQ grills. Northeast Michigan Marine lies immediately west of the fixed highway bridge (Vert Cl: 23 ft/7 m) on your starboard side. They have transient docking for about 2 dozen boats. There is a fuel dock (diesel and gasoline) and a pumpout station. Water and power are available dockside. This is a full-service marina and they can handle engine and fibreglass repairs as well as maintenance on mechanical and electrical systems. Restrooms and showers are available. There is a ship's store as well as picnic area and BBQ grills. Fellows Marina is right next door to Northeast Michigan Marine. There is a fuel dock (diesel and gasoline) and a pumpout station. Water and power are available. This is a full-service marina able to carry out a wide range of repairs and maintenance to engines, mechanical and electrical systems and fibreglass/hull repairs. Restrooms, showers and laundry facilities are available. There is a ship's store, picnic areas and BBQ grills. OYC is located a little further up the Au Sable River, on your starboard side. It may have one or two slips available for transient sailors. They have a club house with restrooms and a bar/restaurant serving lunch and dinner. Family Fare Supermarket, located about 1.5 mi/2.4 km north of the harbor, can handle re-provisioning requirements. Alpena Alcona Area Credit Union is the closest financial institution to the harbor with counter service and ATMs. Alcona Health Center (989) 739-2550 is located in Oscoda Michigan. It is open during regular business hours. After hours, and on weekends, St. Joseph's Hospital runs an emergency Walk In Clinic (989) 739-1441. The nearest hospital is St. Joseph's Hospital (989) 362-3411 in Tawas, 16 mi/26 km south. Gilbert's Drugs (989) 739-7585 is the nearest pharmacy in Oscoda Michigan to the harbor. For dining options in Oscoda MI, try the Au Sable Inn, Chee Peng or Mama's Country Kitchen. All offer good meals and pleasant surroundings. Wiltsie's Brew Pub and Family Restaurant is a craft brewery with a good selection of local and regional beers and a hearty menu featuring steaks and ribs. This is fishing country and if you are a fisherman too, you have come to the right place. The Au Sable River is a magnet for fishermen and Fellows Marina in Oscoda Michigan has one of the largest tackle shops for miles around. There are a number of fishing charter services available as well. The last weekend in June is the Art On The Beach festival which draws exhibitors to Oscoda Michigan from across the United Statesw. In July, there is a major fishing tournament and world-class canoe race that brings competitors from across the US and from Canada. Enjoy the Au Sable River Queen, a paddlewheel riverboatas it cruises the river and surrounding waters. It features live music on its cruises. And of course, there are the beaches - 20 mi/32 km of them. Throughout the summer, there is also the weekly Concert On The Beach program. There is also the Oscoda Michigan site that will give you more ideas on getting the most of your visit.